(L-R) Portsmouth’s Olivia Ramey, Maddison Perry, and Cassie Potts each went yard in the Trojans’ 9-0 win over Rock Hill Monday. Monday’s win also happened to be Portsmouth’s “Strikeout cancer” game in memory of Amy Keating, a Portsmouth High School teacher who passed away in February after a battle with cancer. PORTSMOUTH – Most times, life is bigger than what goes on on the gridiron, on a basketball court, or in a baseball diamond. That’s what makes sports so special: the ability to use it as an escape from reality and be able to set worldly problems and concerns to the side. Another great thing about sports is the ability to use it to remember something: a moment in history such as Jackie Robinson Day, a national moment like President Bush throwing the missile-like first pitch after 9/11, or the passing of a loved one far too soon. 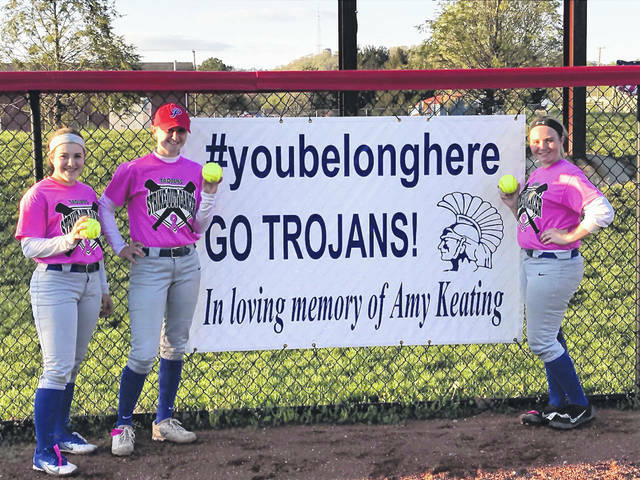 Portsmouth’s softball program used sports as a time to remember Amy Keating, an english teacher at Portsmouth High School who passed away on February 5th of this year after her battle with cancer. Trojans’ softball coach Kristen Bradshaw, Keating’s cousin, felt more than compelled to do what she could to remember someone who meant so much to her. All proceeds from Monday’s game between Rock Hill and Portsmouth were donated to breast cancer awareness research, an idea that Bradshaw’s team was all about. Not only did they raise money for a great cause, Portsmouth also took care of business on the back end with a 9-0 win over the Redwomen of Rock Hill Monday evening. For a single performance, Bradshaw is unsure if she could be any prouder of her team following Monday’s win. It doesn’t get much better than that if you’re a sucker for incredible stories like this one. Playing their best game of the season with all the elements surrounding the game, what more can you ask for if you’re a head coach? With their new record sitting at 7-9, Bradshaw is hoping that her team will use Monday’s win as an example of what they’re capable of and ride into postseason play in May playing their best softball.